Can a Sanders Democrat Win the New Jersey Governor’s Race? John Wisniewski is fighting Wall Street money and the party machine. Whither the Democrats after 2016? A year before the 2018 midterm elections, that question will get its first real test in New Jersey, one of only two states (along with Virginia) where the governorship is at stake this year. And just as last year’s presidential primary pitted Hillary Clinton, the establishment candidate, against Bernie Sanders, a left-leaning insurgent, the two leading candidates in New Jersey’s 2017 Democratic primary have staked out their turf in the party’s Clinton and Sanders wings. Voters in deep-blue New Jersey, who have groaned under the weight of Governor Chris Christie’s Republican administration since 2009, are eager for a fresh start. With Christie’s approval rating at an all-time low of just 18 percent, the odds strongly favor a Democratic win over any of the potential GOP candidates aiming to succeed him. The state’s Democratic primary, which takes place in June, is shaping up as a choice between the favorite, Phil Murphy, a multimillionaire and former Goldman Sachs executive with strong backing from the party establishment, and his leading challenger, Assemblyman John Wisniewski, a veteran legislator and former chair of Sanders’s presidential effort in the state. For Wisniewski, the primary is an uphill climb, and he’s running an insurgent, populist-tinged campaign that he hopes will inspire the same enthusiasm that energized the Sanders movement. Perhaps the biggest challenge that Wisniewski faces is New Jersey’s entrenched system of party bosses. The state is notorious for the power wielded behind the scenes by a handful of figures, such as South Jersey’s George Norcross, an insurance executive, and North Jersey’s Joseph DiVincenzo Jr., the Essex County executive (whose domain includes Newark). Along with other, less powerful Democratic machines and the party chairpersons in each of New Jersey’s 21 counties, they exert enormous influence in primary elections, in part by controlling which candidate gets the favored first line on the ballot. In the 2016 presidential primary, the entire New Jersey Democratic leadership, including all of the state’s elected officials (except Wisniewski), lined up for Clinton, who won 566,247 votes to Sanders’s 328,058. In addition to the county leaders, Murphy has lined up support from New Jersey’s two senators, Cory Booker and Bob Menendez; most of organized labor, including the New Jersey Education Association (NJEA) and the Communications Workers of America (CWA); and prominent leaders like Newark Mayor Ras Baraka. 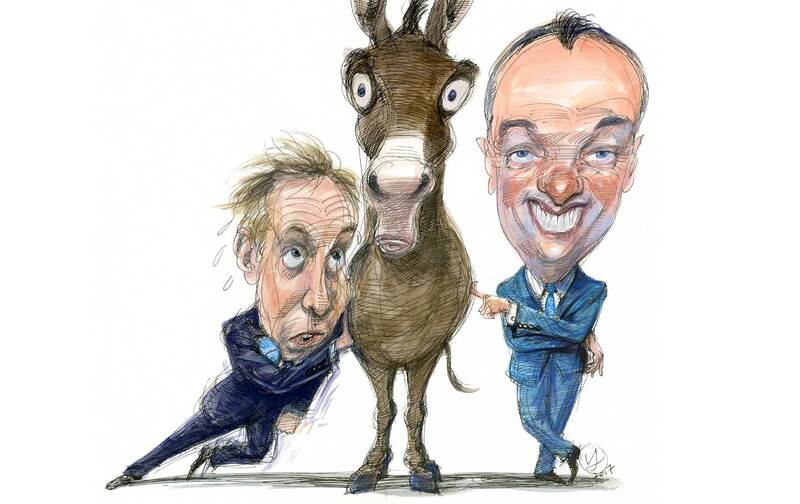 Though Murphy is the clear favorite in a race that includes Wisniewski and several other challengers, he has opted to single out Wisniewski for strongly worded attacks, with Murphy’s campaign calling him a “21-year Trenton insider and party boss”—even though not a single one of New Jersey’s actual bosses have backed Wisniew­ski, and most have lined up in Murphy’s camp. First elected to the state assembly in 1995, Wisniewski might seem to be a creature of business-as-usual Jersey politics, at least on the surface. Over the past two decades, he has chaired the Assembly’s transportation committee; led the 2011 reapportionment effort; served for three years as chairman of the New Jersey State Democratic Committee; and was a member of the Democratic National Committee. But if you look a little deeper, you’ll see that Wisniewski has a strong independent streak. He hails from the city of Sayreville in central New Jersey, a former industrial town along the Raritan River whose factories have mostly shuttered since the 1960s, and he’s repeatedly been elected with strong support from labor and progressive groups. (Among his other achievements, he’s earned a lifetime score of 0 percent from the American Conservative Union for his voting record.) And he’s bucked the Democratic Party leadership and its boss-driven agenda time and time again. And in 2013, when Christie found himself enmeshed in a scandal over politically motivated lane closings on the George Washington Bridge, Wisniewski led the special committee investigating Christie and his cronies—but he says that leading Democrats in the Legislature expressed concern about his rocking the boat. “I received calls from Democrats saying, ‘John, this is not going to end well,’” Wisniewski recounted, “or, more tellingly, ‘You’re making it hard to get things done. The governor’s not going to agree to do things if you’re pursuing him.’” New Jersey, Wisniewski adds, is all about making deals, and some Democrats feared that his “Bridgegate” committee would hurt their ability to make deals with the Republican governor. One cause for concern was John Currie, chairman of the state Democratic committee and a strong Clinton supporter. “John Currie was furious that I came out for Bernie Sanders,” Wisniewski said. Months later, Currie got his revenge. In June 2016, Currie unceremoniously booted Wisniewski (along with Reni Erdos, another Sanders supporter) from the DNC, replacing him with an insurance executive who was also a party fund-raiser. “They weren’t content just to be cheerleaders for Hillary Clinton,” Wisniewski told The Nation. “They wanted to make sure that there was no opposition at all.” In the end, not a single party leader, big-city mayor, member of the State Legislature, or member of Congress from New Jersey backed Sanders. “They feared that what John Currie did to me, he’d do to them,” Wisniewski said. Were Wisniewski to win the June primary, of course, Currie and the rest of the Democratic establishment would probably support him, though there’s no guarantee: In 2013, when Christie was running for reelection, a number of Democratic bosses in the state opted not to back Barbara Buono, their own party’s nominee. After her defeat, Buono issued a scathing denunciation of the “onslaught of betrayal” by “the Democratic bosses, some elected and some not,” who covertly supported Christie. Meanwhile, a few days later, The Nation caught up with Phil Murphy at a gathering of the Northeast Regional Council of Carpenters. Around 800 members packed a room at the Renaissance Woodbridge Hotel in Iselin, New Jersey, for a town hall organized in conjunction with Murphy’s campaign. “We endorsed Murphy back in October,” said Kevin Davitt, a spokesman for the carpenters’ union. Murphy, who’s been preparing to run for governor for several years, has aggressively courted labor’s support, and he’s earned the backing of the NJEA, the CWA, the Service Employees International Union, the Laborers’ International Union of North America, and the police and firefighters’ unions. Tall, slim, and fit, and bearing an uncanny resemblance to the actor Michael Keaton, Murphy bounded onto the stage in Iselin, energetic and brimming with enthusiasm. He grabbed the mike, called out to people in the audience, acknowledged the standing ovation, and then shed his jacket. “What an extraordinary show of support!” he exclaimed. After a punchy speech to open the event, Murphy took questions from the crowd for more than an hour. There was, however, evidence of careful orchestration for the slickly produced event. Just before John Ballantyne, the union’s leader, introduced Murphy, dozens of carpenters dutifully filed in to stand behind the stage as a camera-ready backdrop. People working for Murphy were everywhere, including videographers, press people, and event managers. Almost every question from the audience was prearranged, according to documents obtained by The Nation, which include an e-mail from Michelle McCormick of Groundwork Strategies, a PR firm, to Kenneth Smith of SmithMedia: “I’ve attached a draft agenda and the candidate questions for your reference”—along with a list of five questions to be asked by the audience. Sure enough, as Murphy called on “random” audience members, the printed questions on the list were read. Murphy was hired by Goldman Sachs in 1983, when he was fresh out of college. His many years there shaped his worldview and left him with a Rolodex of powerful contacts. “We [at Goldman Sachs] are elite in the sense the Marine Corps is elite,” Murphy said in 1998, according to The Wall Street Journal. After stints heading Goldman’s Asia and Germany operations, Murphy returned to the New York headquarters in 1999, just as the firm—and Wall Street—were undergoing a dramatic transformation. That was the year Glass-Steagall was repealed and a ban was placed on the regulation of derivatives. Both moves were orchestrated by Robert Rubin, the Clinton administration’s Treasury secretary and another Goldman Sachs alum, and they took Wall Street and investment banks like Goldman to new levels of risky, highly leveraged speculative activities. In 1999, Murphy joined the firm’s management committee, an elite group that included Hank Paulson, later George W. Bush’s Treasury secretary, and Gary Cohn, now President Trump’s top economic adviser. Two years later, he became co-head of the division overseeing the assets of pensions, foundations, hedge funds, and other institutions and wealthy individuals managed by Goldman, which totaled $373 billion by 2003. And as a prime broker for investors, his division fed hedge-fund clients enormous lines of credit, fueling Wall Street’s speculative bubble. Murphy gave up his day-to-day role at Goldman in 2003, becoming a senior director before finally leaving the firm in 2006. That year, he took over as finance chair of the Democratic National Committee, where he worked alongside Howard Dean, coaxing checks from wealthy donors, including Wall Street bankers and hedge-fund moguls. “We raised almost $300 million in my three years there,” Murphy told The Nation. By 2009, he and his wife made personal contributions totaling nearly $1.5 million to Democratic candidates, committees, and party organizations, according to the Center for Responsive Politics. In keeping with the long-standing presidential habit of appointing big donors as ambassadors, President Obama tapped Murphy in 2009 to be US ambassador to Germany. Murphy’s Goldman connections were instrumental in his transition from Wall Street to politics. “He is a close confidant of former treasury secretary and Wall Street veteran Robert Rubin, the éminence grise of the Democratic Party when it comes to financial issues,” reported the German weekly Der Spiegel after Murphy was named ambassador. “It was through his connection to Rubin that Murphy began working as a Democratic Party fundraiser.” Murphy also had ties to Michael Froman, Rubin’s chief of staff at the Treasury. According to WikiLeaks, in 2008, it was Froman who recommended to John Podesta, then overseeing Obama’s transition, that Murphy get a top job in the administration. There are some differences as well between the two candidates. Wisniewski, as noted earlier, strongly supports a Medicare-for-all single-payer plan for New Jersey; Murphy suggests that while he favors such a plan in principle, it’s more practical now to defend the Affordable Care Act. And while Wisniewski supports making state colleges and universities free to New Jersey residents earning less than $125,000 a year, echoing Sanders’s 2016 pledge, Murphy’s higher-education plan is focused on loan relief and refinancing. Today, as noted earlier, both the NJEA and the CWA are backing Murphy. Hetty Rosenstein, the CWA-NJ state director, admitted that back in 2005, her union was unhappy with the Murphy-led commission—but she and other union leaders point out, rather illogically, that the measures proposed in that report have largely been enacted since then, especially during Christie’s all-out assault on state employees in 2011. And, Rosenstein added, “Murphy’s perspective in support of collective bargaining, having seen it in the intensely unionized society in Germany—well, that impressed us.” Besides, she said, his support from New Jersey’s county chairs, which all but guarantees Murphy the top ballot line, is probably decisive: “You can’t win a primary off the line.” Does that mean the CWA’s decision to support Murphy is a pragmatic one? “It is partially pragmatic,” she replied. Barbara DreyfussBarbara Dreyfuss is the author of Hedge Hogs: The Cowboy Traders Behind Wall Street’s Largest Hedge Fund Disaster.